A young female opossum growls at Pam Richardson, assistant gamekeeper at Maine Wildlife Park in Gray, on Oct. 22, 2012. When the motion sensor light on the porch switched on at 11 p.m., Susan Dolloff figured it was the stray cat that roams her neighborhood in western Maine. Her family puts food out for the feral feline. They love animals, both wild and domestic. But that night, it wasn’t the cat. Its long snout was buried in a bowl of meat scraps. An opossum was their unexpected visitor. Opossums have a varied diet. The wild critter is fairly new to the state, having expanded its territory north into southern Maine over the past decade. More and more, Mainers are encountering this highly adaptable marsupial. “Now, it’s like there’s a possum under every bird feeder,” Keel Kemper, state regional wildlife biologist in central Maine, said. With a long, tapering snout and a nearly-bald tail, opossums are often mistaken for giant rats, measuring 2 to 3 feet long. However, the two animals are not even remotely related. Opossums are a primitive mammal, their origins reaching back to 65 to 90 million years ago, and they’re the only marsupial in United States. They carry their babies in external pouches, like a kangaroo. They also boast 50 teeth — more than any other mammal. Despite the creature’s less than charming appearance, the Dolloffs have decided that they wanted it to stick around. Living in the mountainous forest of western Maine, the couple enjoys watching wildlife, and they usually don’t play favorites. They feed the birds, and they feed the squirrels. They welcome deer to their yard, as well as moose. Opossums will bare their teeth, growl and hiss when threatened, according to the Maine Department of Inland Fisheries and Wildlife, but they are generally not aggressive animals and seldom cause problems for homeowners. Nevertheless, Kemper has received several calls recently from people who are concerned they might be attacked by these relative newcomers. “Playing possum” is a catatonic state that the opossum uses to trick predators. 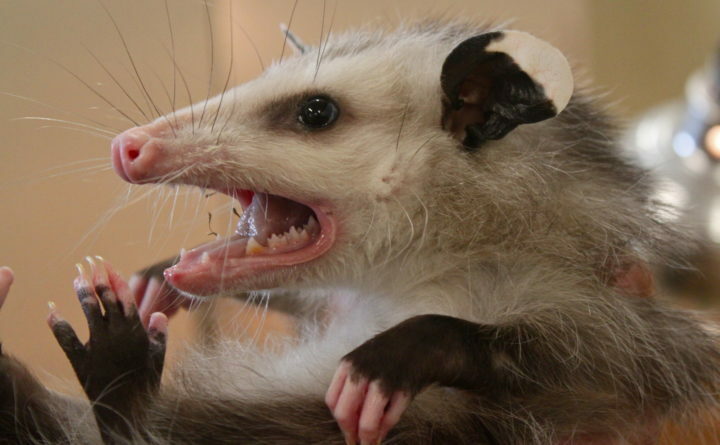 During this state, the opossum’s mouth lolls open and it secretes a foul-smelling substance to simulate the smell of death. This will often cause the predator to walk away, tricked into thinking the opossum is rotten. Another way opossum protect themselves is by climbing. They use their prehensile tails to grasp at things, like tree branches, and they have digits on their hind feet that act like opposable thumbs. They’re also immune to snake venom. Opossums are adaptable because they’ll eat practically anything and they will create dens nearly anywhere that’s dry, sheltered and safe. This includes woodpiles, hollow stumps, rock crevices and under buildings. But like any creature, the opossum does have vulnerabilities. One is that the creature is not particularly well suited for the Maine winter, for a number of reasons. A nocturnal animal, the opossum doesn’t hibernate, nor is it in the habit of storing food for the winter. Instead, it forages year-round. Therefore, when food sources are scarce during the winter, they can easily starve. In addition, the opossum isn’t built for the cold. State biologists and wildlife rehabilitators in Maine have frequently found opossums with frostbite on their naked ears, tails and toes. And because the animal doesn’t put on much fat for the winter, it can have a difficult time maintaining its body temperature. Regardless of their vulnerability to the cold and barren landscape of winter in Maine, some opossums seem to be surviving, Kemper said. And he believes it’s because they’re finding shelter — often manmade shelter. The opossum returned to the Dolloffs’ porch just the other night, and they’ve spotted it under their bird feeders — a sign that the animal has found a suitable spot nearby to weather the winter. “We think it’s staying in the barn,” Dolloff said. While the Dolloffs don’t mind having a resident opossum, some people do. After all, due to their need to forage for food, opossums will get into vegetable gardens, trash cans, recycling bins, compost piles, stored grain and chicken coops. The best way to rid yourself of an opossum is to block these food sources, according to the DIF&W. Store your garbage, compost and other sources of food in secure containers; fence in gardens; install predator guards on fruit trees; clean up barbeque areas and fallen birdseed; and if you must feed pets outdoors, do so in late morning or at midday, then pick up food well before dark. Another way to discourage opossum from settling near or in your home is by eliminating access to potential den sites, such as chimneys, attics and spaces under houses, porches and sheds. To do this, inspect the buildings on your property and close any potential entries with mesh hardware cloth, boards or metal flashing. Or, another way to make a den site unattractive is by adding lighting to it or a portable radio. Just be sure not to close up a den site with an animal inside. Whatever you decide — pest or guest — it looks like the opossum is here to stay. The good news is that opossums don’t have a track record of being aggressive to cats and dogs. They’re a clean animal, spending much of its time grooming, like a cat. And while all mammals are capable of carrying rabies, opossums rarely carry the disease. In the U.S., the animals most likely to carry and transmit rabies are raccoons, skunks, bats, foxes and coyotes, according to the U.S. Centers for Disease Control and Prevention.